Today we learnt that economic growth slowed significantly at the end of 2018, with GDP only growing by 0.2 per cent in the last three months of the year. This is around a third of the pre-crisis average rate. In December alone, the economy contracted by 0.4 per cent with the manufacturing sector now having contracted for the last six months. That our economy is not growing fast shouldn’t surprise anyone, given the weakening global outlook and heightened Brexit uncertainty of recent months. But, surprising or not, what’s happening to our economy deserves greater attention. Because while politicians endlessly debate Brexit in the House of Commons and fail to agree on a way forward, family finances are being affected in the here and now. 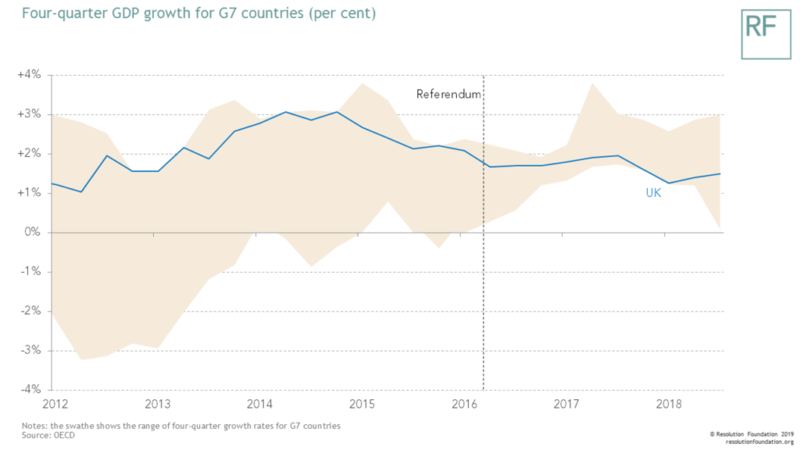 Weaker growth in the fourth quarter of 2018 follows a general growth slowdown since the referendum in 2016. Not the recession some unwisely predicted, but the slow burn of an economy seeing less productivity growth than had been expected. The result is that our economy is now 1.2 per cent smaller today than the OBR projected it would be before the referendum. That’s £24 billion, or £800 a year for every household in the UK. The Bank of England thinks the GDP hit is nearer 1.5 per cent, while other research finds a slightly bigger effect. But the fact that we’re doing less well at producing stuff than expected isn’t the end of the story. In fact, household incomes have taken a much bigger hit than GDP over the past two and a half years. That’s because they have faced a second headwind of prices rising faster in the shops than had been expected. This is the result of the tanking of sterling pushing up import prices, and therefore the costs of what we all as consumers buy. 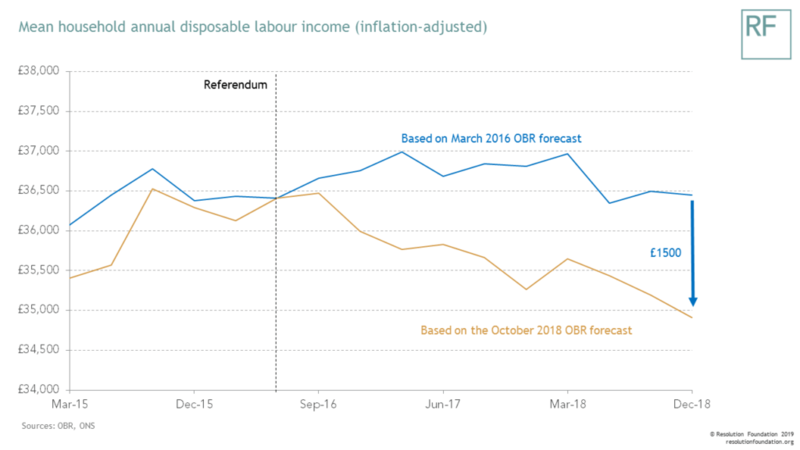 Putting these (low) growth and (high) inflation trends together, new Resolution Foundation research finds that real household incomes are a very worrying £1,500 lower than they were expected to be, according to pre-referendum forecasts, and despite employment continuing to reach new record highs. If that’s not enough to remind politicians on all sides of how high the stakes are I don’t know what is. Now of course no one can say definitively what impact Brexit itself has had, or that all £1,500 of the income underperformance is because of it. But it is very hard to avoid concluding that it’s the single biggest driver – not least because of the key role of higher inflation. Yes there has been a recent slowdown in other countries – notably Italy, Japan and China – but the UK’s underperformance predates that. Besides, over the post-referendum period as a whole, the global economy has actually done better than expected. Indeed household incomes are actually more like £2,000 down today compared to the situation in which they had grown in line with an average rate of advanced economies post-referendum. 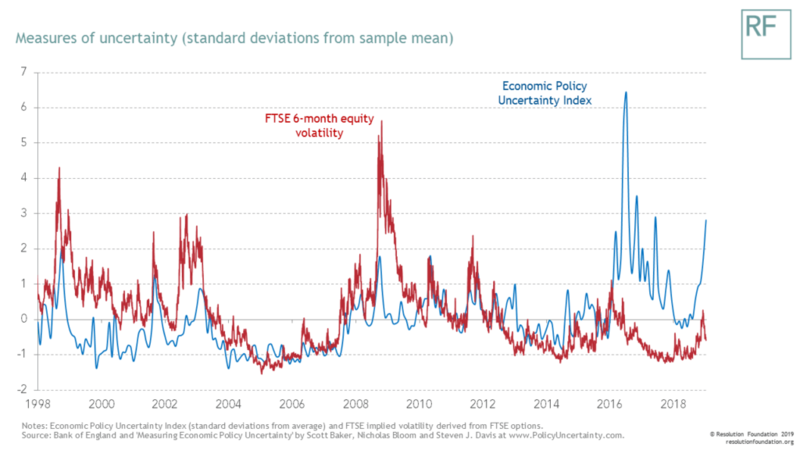 So yes the global economy is important – but this is principally a UK story. But we also need to be clear that it’s not just the fact of Brexit dragging on growth and incomes. The long-run impact of Brexit on our economy will of course depend on what we eventually agree by way of a new trading relationship with the EU, but this isn’t just about where we end up, it’s about how we get there. Politicians are currently doing a truly awful job of working through that difficult journey, and that is far from cost free. Theresa May opposes a customs union while basically making the case for one (to avoid tariffs or rules of origin checks) while Labour pretends we can be “aligned” to the single market while avoiding state aid rules or freedom of movement. Every interview where politicians fail to explain exactly what kind of relationship they favour, or the trade-offs they would make, contributes to the recent spike in economic uncertainty. Research shows, and our recent incredibly weak investment performance reinforces, that can have a very real impact on business investment – one of the key drivers of living standards growth. Now some of that investment will simply be delayed. But any that instead goes elsewhere, or simply never happens, represents a hit not just to some abstract line in our national accounts, but to family living standards that have already faced an unprecedented decade of stagnation. Running down the clock might seem unavoidable for those seeking to manage deep divisions within their parties, but it is inexcusable economic vandalism none the less. So today’s growth figures, coming as they do on the back of a major hit to household finances since 2016, should remind politicians in all parties of how high the stakes are, and that how the country goes forward, not just where it is heading, matters for our living standards.